The trade deadline is on February 21. So far, the Memphis Grizzlies have been very active in dealing their players and shedding salaries to avoid the luxury tax. The biggest trade of 2013 (for now) was sending Rudy Gay to the Raptors while the Raps sent Ed Davis to the Grizz and Jose Calderon to the Pistons. The Pistons also sent Tayshaun Prince and Austin Daye to the Grizzlies. The Grizzlies are 1-2 since the Gay trade and have fallen out of the Top 5. The Raptors are 1-1 with Gay while the Pistons are 0-1 with Calderon. It's a very small sample but the Raptors appear to have won the trade. Meanwhile, the Spurs still hold the top spot but Tim Duncan suffered a leg injury that could sideline him for a couple of weeks. The Thunder had a chance to overtake the Spurs but Kyrie and the Cavs had other plans. The LA Clippers have lost 3 straight while the Lakers have won 3 straight but are still 3.5 games out of the 8th spot. The Celtics are undefeated with Rondo and Sullinger both out for the season. Will they trade Garnett or Pierce for the future? The Pacers have emerged as the 3rd best team in the East, having beaten the Heat, Bulls and Hawks in one week. The standings are current up to February 6, 2013. The rankings from last week refer to Week 13. 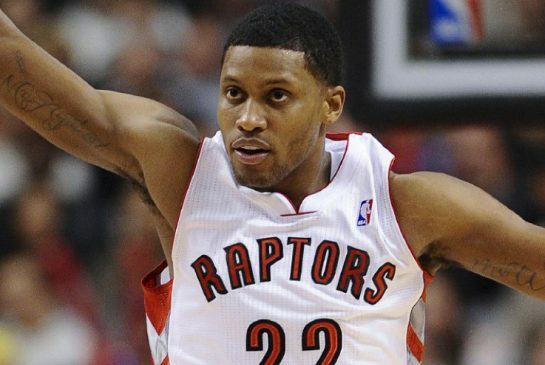 Can Rudy Gay carry the Raptors (11th spot) to the playoffs? The Spurs have won 10 straight games before they embark on their annual Rodeo Road Trip that will last 9 games and cover 18 days. The important part is that Tim Duncan did not suffer a major injury when an opposing player landed on his leg and hurt his knee/ankle. Russell Westbrook had a nice duel with Kyrie Irving until the last minute when Irving made a trey in the clutch. Kevin Durant looks headed to a 4th straight scoring title and quite possibly his first MVP if the Thunder finish with the best record in the NBA. LeBron James shot 13-14 vs the Bobcats which was a career-high. LBJ has been amazing in his last 10 games: 60% shooting, 30 points, 8 boards and 7 helpers. He was named Player of the Month for January. The Big 3 are all shooting over 50%, the Heat is the #1 shooting team. The Knicks have won 5 straight while Amare has played 16 games without a start. Stoudemire is heating up in his last 5 games: 18 ppg on 72% shooting. If he keeps this up, he might give himself a chance to win the Sixth Man award and the Knicks are better with him not starting. The Clippers have lost 3 straight and they are 2-7 in their last 9 games, with CP3 missing all 9. Paul is expected to be back by the weekend. Paul's absence helped boost his contention for the MVP but the Clippers are now 4.5 games behind the best record in the West. The Nuggets have won 7 straight and are 21-3 at home even without an All-star player. They have 6 players who average double digits in points and they share the ball and rebound at an elite rate. They are 3rd in points, 1st in rebounds and 2nd in assists. Andrew Bogut has played 4 of their past 5 games averaging 10 points, 3 blocks and 7 rebounds in 25 minutes. The Warriors are 3-1 in those 4 games. More good news: Steph Curry has played the last 2 games and his ankle seems fine: 18 points and 9 assists in 36 minutes. The Pacers have won 15 straight at home while they defeated the Heat, Bulls and Hawks last week.They are still 29th in scoring but they have sored over 100 in 3 straight games plus they are averaging 106 in their last 4 games, all wins. David West is playing like an All-star: 21 points, 7 boards on 59% shooting in their past 5. The Grizzlies have finally traded Rudy Gay and got Ed Davis, Tayshaun Price and Austin Daye in return. It's hard to say that the Grizz got better after the trade since they are 1-2 and clearly lacking another perimeter threat. Jerryd Bayless has been amazing though: 20 points and 5 assists in his last 5 games. The Bulls were hit with the injury bug with Boozer, Deng and Noah all missing games due to injury. They went 2-2 last week with all their missing players. The bright side: Taj Gibson played heavy minutes due to injuries and garnered 2 straight double-doubles and averaged 15 and 12 in their last 4 games. Brook Lopez was finally named as All-star replacement for Rondo. Did you know that Brook is #4 in PER ahead of Duncan, Melo, Wade and Kobe? The Nets have cooled down going 5-5 in their last 10 games after being 11-2 at one point under interim coach PJ Carlesimo. The Rockets erupted for 140 points and 23 treys (NBA record) in their win against the Warriors. They have reclaimed the top spot in scoring and have 6 players in double figures. They are still safely ahead of the Lakers by 3.5 games but their next 2 games are tough: at Miami and vs Portland who is trying to catch them. The Jazz has gone 7-3 in their last 10 games and Randy Foye has been better than usual in those 10 games scoring 15 points and dishing out 4 assists. Bad news: Gordon Hayward is still injured and is expected to miss his 6th straight game and maybe another week. The Celtics have won 4 straight and are undefeated since Rajon Rondo and Jared Sullinger went down with season-ending injuries. Paul Pierce has picked his scoring up but will that prevent GM Danny Ainge from exploring trades that involve PP or Garnett? The Lakers have won 6 of 7 yet they still trail the 8th spot by 3.5 games. Kobe is still playing a terrific pace of all-around team player basketball but that may change soon since Pau Gasol appears to be injured for some time while Howard is definitely not keen to playing through an injury. LaMarcus Aldridge is showing us that he may be the best PF in the West with Kevin Love injured. LA is averaging 22 and 11 in his past 5 games (21 and 9 for the year). Nic Batum is playing through an injured wrist and that has affected his scoring and overall efficiency (8 ppg, 6 rpg, 5 apg in his last 5). The Hawks are struggling, losing 3 of the last 4 and could have easily lost that lone win against the Raptors. Only Jeff Teague has stepped up his game since Lou Williams was done for the season. Horford and Smith are producing similar numbers prior to Williams' injury. They need to score more. The Bucks wasted a 17-point lead and Samuel Dalembert's best game of his career (35 points and 12 rebounds on 17-21 shooting) when they lost to the Nuggets. The Bucks have lost 3 of their past 4 games. Larry Sanders has increased his lead on Serge Ibaka in the blocks per game category. Dirk Nowitzki is back from his thigh injury and his shooting has suffered. He went 3-11 for 10 points vs the Thunder. Dirk is averaging below 15 points and 6 rebounds for the year. The Lakers are 2.5 games ahead of them now. It says a lot when the Mavs cant afford Vince Carter to miss games and are unwilling to trade him. The Sixers trail the Celtics by 3 games for the 8th spot in the East. They need Bynum ASAP is they want to catch the Celtics especially since their best rebounder, Thad Young has been sidelined for at least 3 weeks due to a hamstring injury. Spencer Hawes needs to have more double-doubles to cover up that loss. The T'wolves appear to be headed to the lottery again this year. They have been hit hard by the injury bug and have lost 7 of their past 8 games. The next 3 games are tough (Spurs, Knicks, Grizzlies). Injured players like Budinger, Brandon Roy and Love are not expected to be back until March. The Pistons have traded away Prince who was the last player from their 2004 championship. Jose Calderon will guide and lead their 2 young studs: Andre Drummond and Greg Monroe. Calderon also allows Brandon Knight to focus on shooting and scoring because he is more of a combo guard. The Raptors went 1-1 with Rudy Gay who can elevate his status as an all-star next year if he continues to lead the Raptors in scoring. They need to trade Bargnani who becomes redundant in their system and maybe they can get a solid defense and rebound-type player in return. The Suns played well vs the Lakers during Steve Nash's homecoming. Michael Beasley was phenomenal in that game as he scored 27 points and had 6 rebounds and 5 steals. Beasley is so inconsistent though since he followed those games with 4 points (loss), 24 points (loss) then 6 points (win). The Kings have lost 4 straight and DeMarcus Cousins got himself ejected vs the Jazz and that was a game that the Kings could have won if DMC played in the 2nd half. Meanwhile, Tyreke Evans continues to struggle and he is scoring at a career-low pace. Dont forget that he was ROY just 3 years ago. The Hornets have lost 4 straight and the luster of Eric Gordon's comeback which translated to some wins have started to tarnish. Gordon doesnt play on back-to-backs and that has hurt his rhythm. He has struggled in his last 3 games, averaging only 14 a game and 2 assists. Kyrie Irving is clutch as he burnt the Thunder with 35 points including a killer 3 against Westbrook. Irving scored 13 points in under 3 minutes and outlasted Westbrook and Durant. He is 6th in scoring and 12th in PER. The East All-stars should have Kyrie start over Rondo. John Wall is starting to get back into game shape but his numbers are still mediocre (14 and 7). His jumper is still erratic but the speed is still there. Their best scorer, Jordan Crawford has not provided much and has been in a shooting slump. In his last 10 games: 18 mins, 7.5 ppg on 41% shooting. The Bobcats have lost 4 in a row but the more important thing is the health of prized rookie, Michael Kidd-Glichrist who suffered a concussion. MKG is recovering and could miss a few games. Byron Mullens is back in action and produced but his shooting numbers are still horrible (37% for the year). The Magic have lost 10 straight and that's there second 10-gamer of the season. Glen Davis broke his foot and is expected to be out 8-12 weeks which essentially means that he is out for the season because the Magic wont make the playoffs. JJ Redick continues to be coveted by most teams and the Magic should unload him.